The annual report showed there were 7,175 bias crimes, which targeted 8,493 victims based on their race and sexual orientation, reported in 2017. The FBI reported more than a 17 percent rise in hate crimes across America, officials said Tuesday — the third consecutive year the numbers have increased. There had been 6,121 hate crimes reported in 2016, 5,850 such offenses in 2015 and 5,479 in 2014. The 17.2 percent spike follows increases of 4.6 percent and 6.7 percent in the previous two years. The hate crime totals were comprised of 59.6 percent acts against a victim based on race, 20.6 percent because of religion and 15.8 percent for sexual orientation, the FBI said. "This report is a call to action — and we will heed that call," acting Attorney General Matt Whitaker said in a prepared statement. "The Department of Justice’s top priority is to reduce violent crime in America, and hate crimes are violent crimes. They are also despicable violations of our core values as Americans. I am particularly troubled by the increase in anti-Semitic hate crimes — which were already the most common religious hate crimes in the United States — that is well documented in this report." 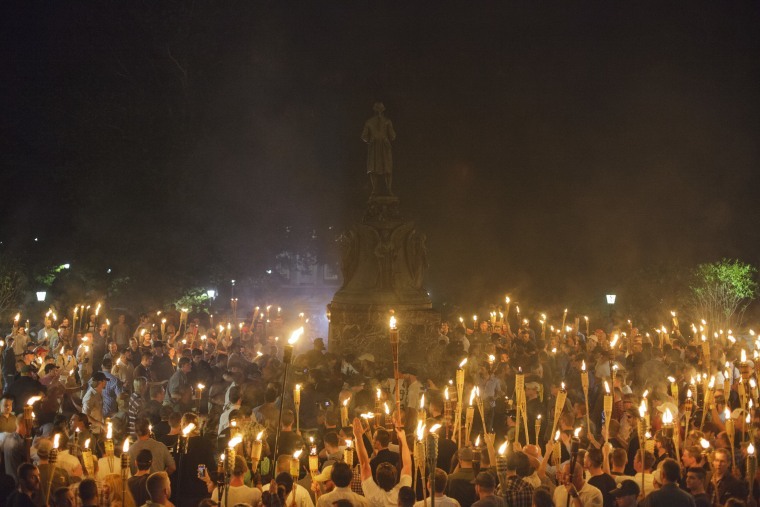 One high-profile example, when tensions spilled over into protests and violence, was the so-called "Unite The Right" rally in Charlottesville, Virginia, in August 2017. Counter-protester Heather Heyer, 32, was killed when suspect James Alex Fields, who had traveled from Ohio to join white nationalists, allegedly plowed his car into her and other demonstrators. Fields, 21, been charged with second-degree murder in state court. A federal grand jury indicted him with a hate crime earlier this year. While the Arab American Institute said the FBI's report correctly captured the rise in hate crimes, the advocacy group insists local police are still under-reporting bias attacks. For example, the group was particularly incredulous that the Las Vegas Metro Police, serving 1.6 million residents, could report zero hate crimes in 2017. "The FBI data does accurately exhibit a trend, that hate crimes are rising," AAI policy analyst Kai Wiggins told NBC News on Tuesday. "But we have a sense that fewer than 5 percent of hate crime actually happening are showing up in FBI data." Reps for Las Vegas police and the FBI could not be immediately reached for comment on Tuesday.